A record-low 4.59 percent of applicants to Harvard College received offers of admission to the Class of 2022 Wednesday, with just 1,962 of 42,749 candidates securing spots in the class. 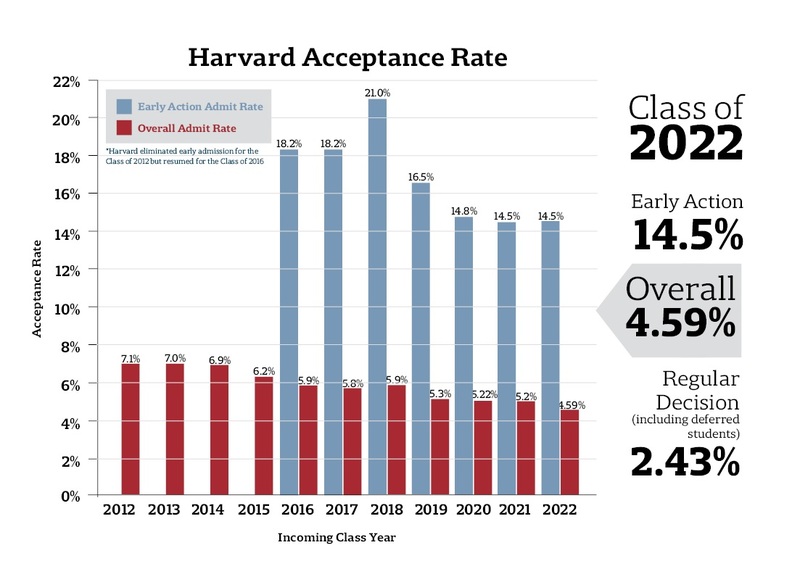 This year marks the first time Harvard’s admission rate has ever dipped below 5 percent. The College notified 998 students of their acceptance in the regular decision cycle at around 7 p.m. Wednesday afternoon. These accepted students make up 2.43 percent of the total 36,119 regular decision applicants, plus the 4,882 students deferred in the early action process. The accepted regular decision students join 964 students who were offered admission through Harvard’s early action process in December. This year’s acceptance rate is the lowest in the history of the College. Down from last year’s 5.2 percent, this year’s rate also marks the fourth consecutive year in which the percentage of admitted students has decreased. The total number of admitted students in the Class of 2022 has also decreased from last year’s 2,056. “They are quite an amazing cohort of people because they’re coming from the widest range of economic and ethnic backgrounds in our history,” Dean of Admissions and Financial Aid William R. Fitzsimmons ’67 said in an interview Wednesday. For the first time in 10 years, a majority of accepted students are women. Women make up 50.1 percent of the admitted class, compared to last year’s 49.2 percent. The percentage of minority admits rose across racial groups relative to last year’s levels. A record 15.5 percent of admitted students are African American, up from last year’s 14.6 percent. Latino admits increased to 12.2 percent from last year’s 11.6 percent. Native American admits grew marginally this year to 2 percent, up from last year’s 1.9 percent. Asian American admits went up to a record 22.7 percent, compared to last year’s 22.2 percent. These demographic shifts come amid a pending lawsuit that alleges Harvard’s race-conscious admissions policies illegally discriminate against Asian-American applicants. The United States Department of Justice is currently investigating Harvard for similar allegations. Harvard has previously denied allegations that it discriminates against Asian-American applicants, arguing a diverse set of factors contribute to its holistic application review process. First-generation college students make up 17.3 percent of this year’s admits, up from 15.1 percent for the admitted Class of 2021. Fitzsimmons also touted the class’s socioeconomic diversity, citing the success of the Harvard Financial Aid Initiative over the past few years in making an education at the College practical for students from low-income backgrounds. Currently more than half of students at the College receive some form of need-based financial aid. Twenty percent of families—those making less than $65,000 annually—pay nothing at all toward the cost of their student’s Harvard education. “The doubling of the applicant pool is a measure of exactly how important financial aid is to making a case to people that whoever you are, you can afford to be here,” Fitzsimmons said. This year, a record 20.3 percent of admits could qualify for Federal Pell grants, money allotted under a government initiative that seeks to help low-income students. Fitzsimmons said the number of admitted students eligible for these grants has doubled since the launch of the financial aid initiative in 2004 . Students admitted to the Class of 2022 hail from all 50 states, and 90 countries around the world. International students make up 12 percent of admitted students, up from 11.4 percent last year. This year’s admission cycle comes after a record-high 84 percent of the admitted Class of 2021 chose to matriculate. The unusually large class size forced administrators to house 28 freshmen in overflow housing. Fitzsimmons previously said the College planned to admit fewer students into the Class of 2022 in hopes of allowing “40 to 50 to maybe 100 people” off the waitlist. Last year, Harvard did not admit any students from the waitlist. Fitzsimmons said the Admissions Office’s target class size is around 1,665, indicating a predicted yield of around 85 percent for the Class of 2022. The sticker price for enrolling in the Class of 2022 will be the highest in the College’s history. The total cost of attendance for the 2018-2019 academic year will be $67,580, an increase of 3 percent over the previous year. Acceptance letters slated to be sent to students Thursday will include an invitation to Visitas—the College’s visiting weekend for admitted students—which will run from April 21 to April 23. Students have until May 1 to accept, defer, or decline their offers of admission.